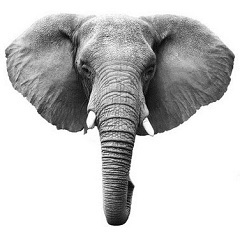 The information in this report relates solely to proposals for ICD-11. It does not apply to ICD-10-CM, the forthcoming US “Clinical Modification” of ICD-10. 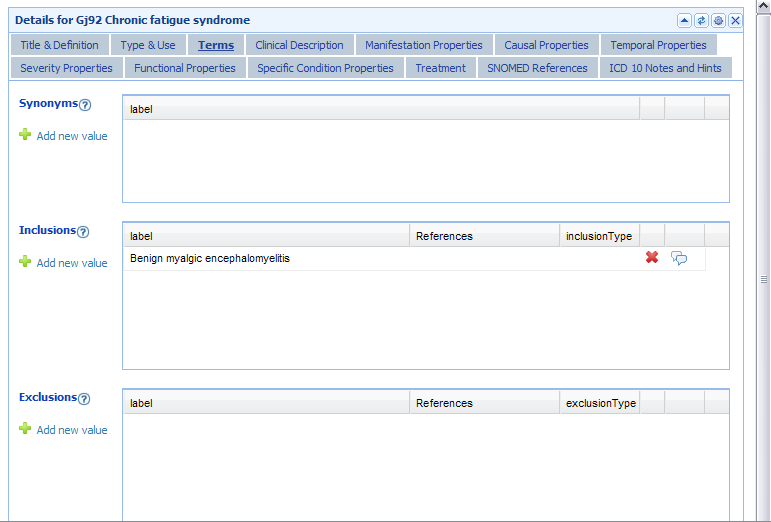 For information on ICD-10-CM see Post #45. Note that in early November, the iCAT was taken out of the public domain and you will not now be able to view the screenshots below, in situ. According to sources, a print version of the ICD-11 Alpha Draft is now expected to made available around the time that iCamp2 takes place. No Agenda is available yet for this September meeting. 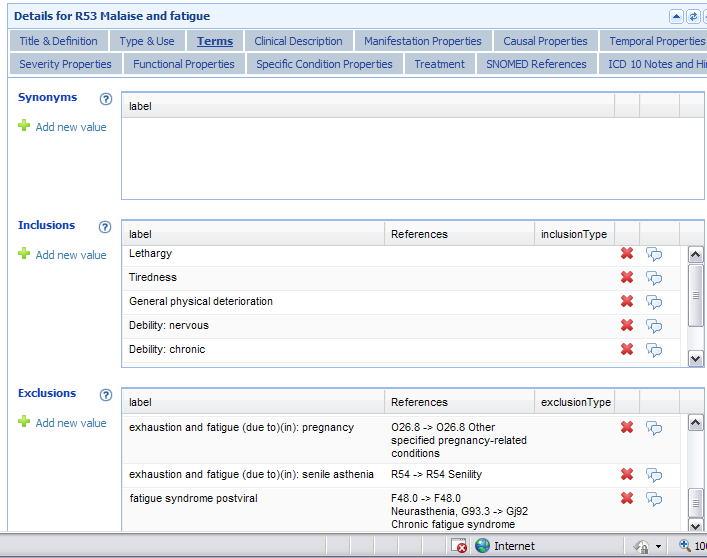 The ICD-11 Beta Draft is timetabled for May 2011. It is understood that the ICD-11 alpha draft is being created for internal users, was not expected to be complete by May 2010, but released as a “work in progress” towards the beta stage. 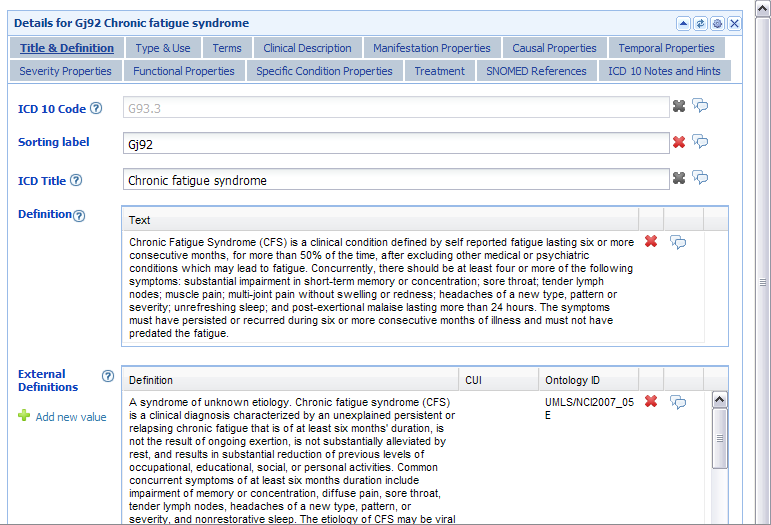 The Beta Draft for ICD-11, scheduled for May 2011, will be subjected to systematic field trials. It remains unclear at what point in the timeline the Beta would be made available for public comment. In the meantime, I have asked for information about the availability of Topic Advisory Group proposal forms for stakeholder input, up to what stage in the development process timeline these might be used, and which stakeholders are going to be permitted to make use of proposal forms. 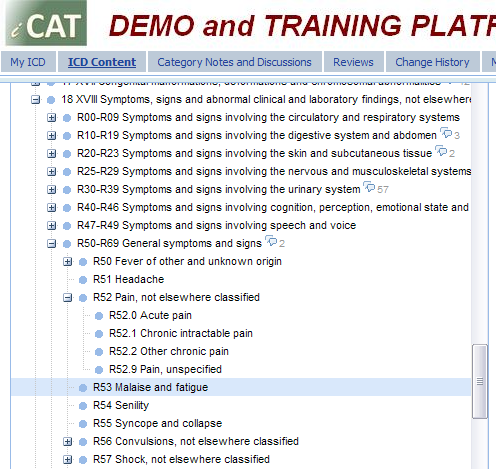 In the posting ICD-11 Alpha Draft scheduled to launch between 10 and 17 May, 6 May, I reported that it is already possible to view a “Demo and Training iCAT Platform” and also access the iCAT production server. I cautioned that until an official ICD-11 Alpha Draft is released, it cannot be determined how far the various Topic Advisory Groups have progressed with revising classifications and populating textual content according to a common “Content Model” for the ICD Chapters and categories of interest to us [Key document 1b]. 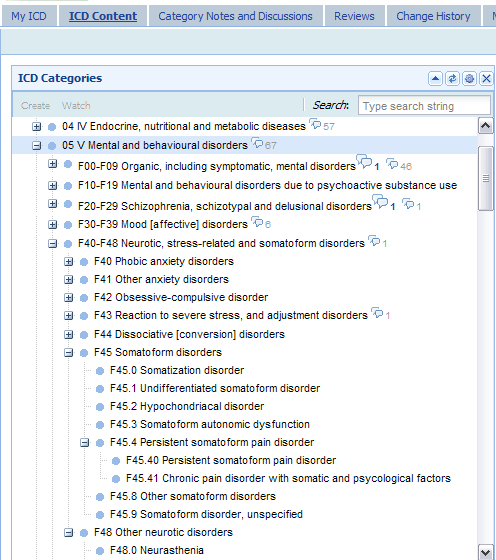 I noted that the Demo and Training iCAT Platform, at that point, was sparsely populated for content and that the classifications and codings listed within the various chapters appeared to have been imported from ICD-10, with little discernable change – presumably as the starting point for the drafting process. Note that anyone can view the Demo and Training iCAT Platform and iCAT production server but only WHO, ICD Revision and IT personnel and the Managers and members of the various Topic Advisory Groups (TAGS will have editorial access. External reviewers recruited by TAG Managers will also use the iCAT to upload reviews and comment on proposals and content. Note: Screenshots are taken from the Demo and Training iCAT Platform and iCAT production server as they stood at 24 May 2010. Alpha drafting is an ongoing process and what currently appears may be subject to revision, refinement and additions. Not all the classification and content work currently being undertaken may have been entered into the iCAT. All screenshots as they stood at 24 May 2010. 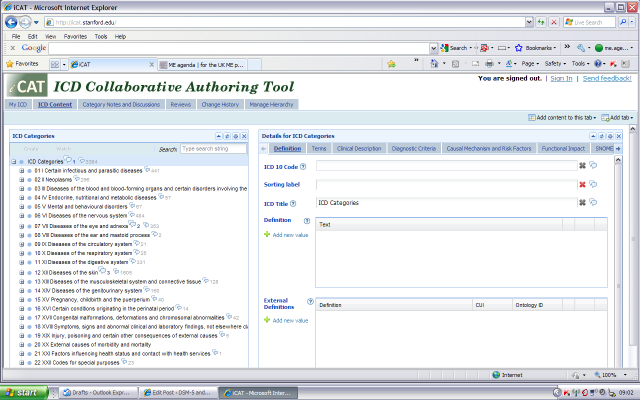 A wiki-like Collaborative Authoring Tool (known as the iCAT) is being used for the initial authoring of the alpha draft. 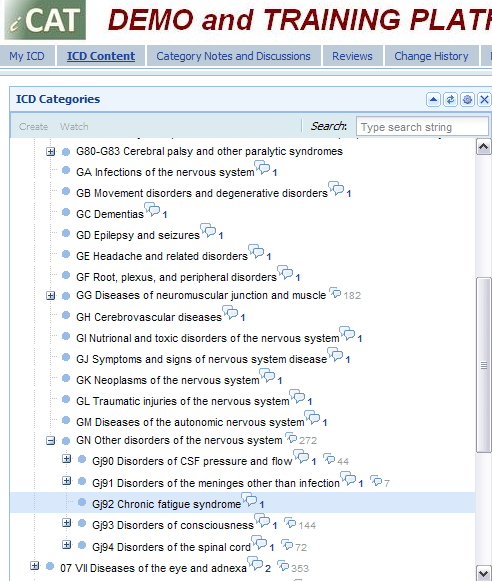 Welcome to iCAT – the Initial ICD 11 Collaborative Authoring Tool! 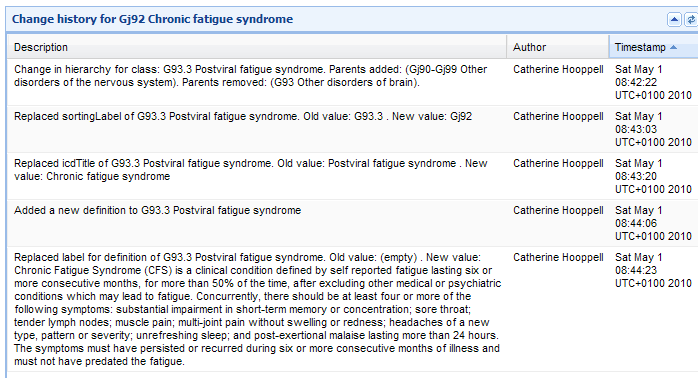 Benign myalgic encephalomyelitis currently appears listed under Inclusions to Gj92 Chronic fatigue syndrome. Details: Exclusion terms help users eliminate entities that should be assigned to a different ICD category because of differences in meaning or terminology. 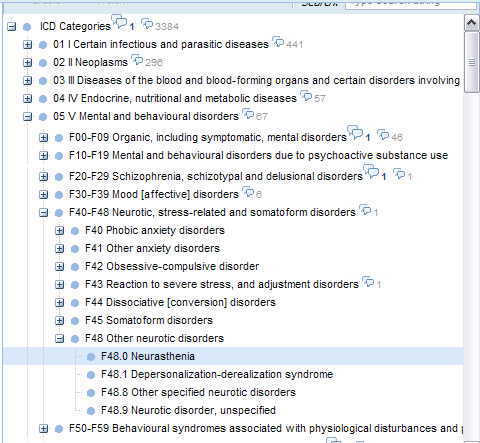 Chapter 5 (V) Somatoform Disorders at F45 (currently same as or near ICD-10). 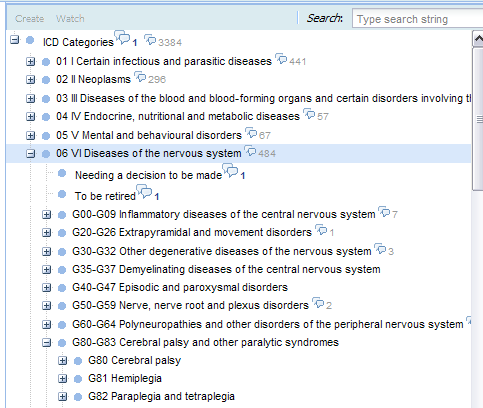 Here are the two Category discussion Notes that appear directly beneath 06 VI Diseases of the nervous system (no ICD10 concepts from Chapter 06 VI are currently moved into either of these “holding pens”). 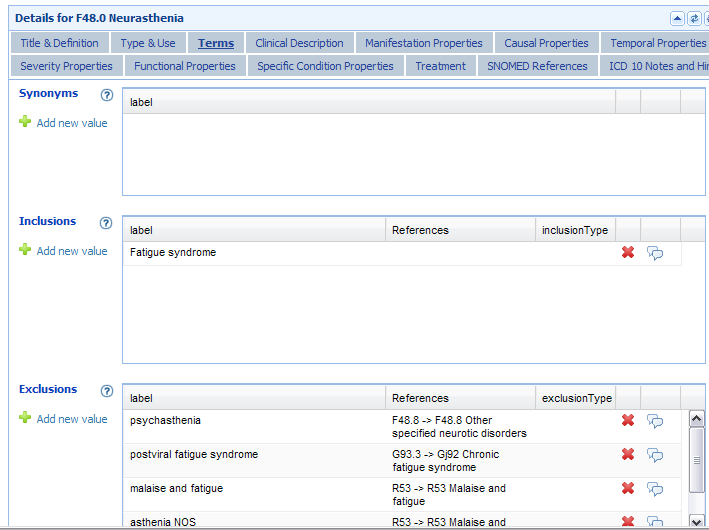 A more recent version of the Content Model document was uploaded to the ICD Revision site on 22 February 2011.